Folding paper by hand and using folding bones is time consuming, and therefore, costly. Purchasing a paper folder is an investment to be considered by all businesses that are looking to increase their productivity and save money in the long run. Paper folders can be divided into two main categories determined by the type of feeding system they use: Friction Feed and Air Feed. Friction fed paper folders use rubber rollers to grab and insert the paper into the folding machine. This is the most commonly used type of feeding system, however it cannot be used with all applications. The rubber rollers can cause tracking or smudging of copier toner. In addition, the rubber rollers do not work well with glossy paper stock. Glossy stock can sometimes cause such problems as slipped paper, mis-feeds, and paper jams when used with friction fed paper folding machines. For this reason, applications that contain heavy ink or toner coverage, or are on glossy or coated paper stock should be run on air-fed folders. Air-fed paper folders use a vacuum pump that picks up individual sheets of paper and inserts them into the machine using a gust of suctioned air. Because there are no parts that touch the paper (other than the folding bars) your folded sheet emerges smudge free. 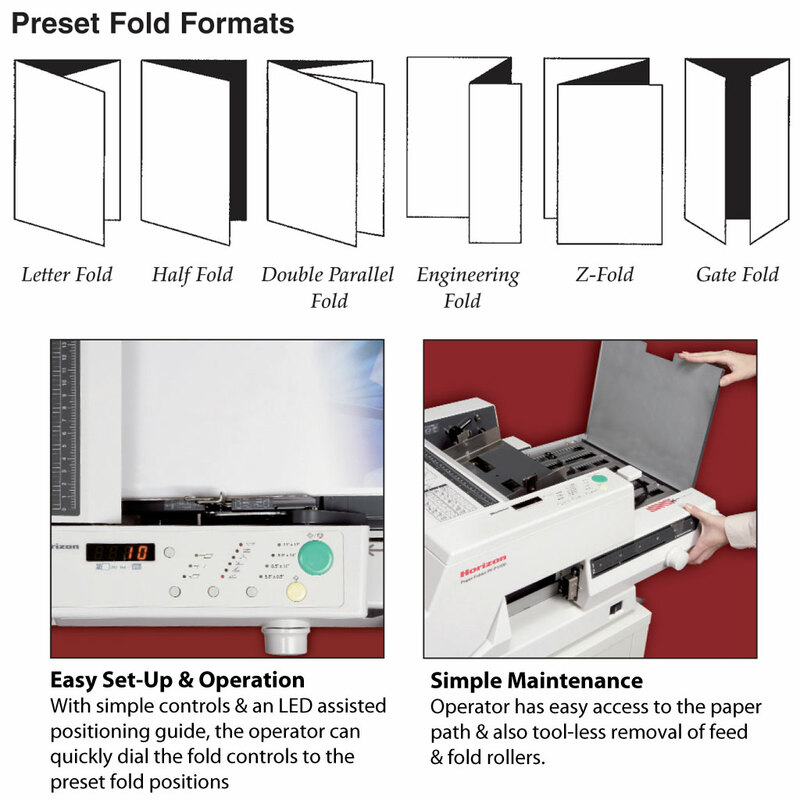 The PF-P3100 Paper Folder by Standard Duplicating is a frictin fed paper folding machine, and has many advantages over some competing models, including an integrated exit conveyor, energy save mode, user friendly access to the folding plates, and preset sheet sizes that now include 8.5" x 14" legal paper, along with others. A special feature of the P-3100 paper folding machine is its unique speed mode selection that includes a silent mode or slow mode; perfect for when running the machine in a quiet environment, such as a sales office. The top level, sound deadening design, ensures quiet operation and does not disturb office environment, as other paper folders may do. In the silent mode, the sound pressure is reduced up to 40% compared to other models in this range. The high-speed mode has a maximum folding speed of 240 sheets per minute (A4 / 8.5" x 11" single fold) and is suitable for folding thicker sheets up to 80# paper stock. In the high-speed mode, the folding speed is increased by 40% over other models in this range. The standard folding mode uses a unique drive control system that offers quieter operation at a higher production speed (about 140 sheets per minute with A4 / 8.5" x 11" single fold) and last but not least, the power saving mode is energy efficient for environmental friendly operation. The PF-P3100 paper folder also provides a neatly stacked delivery conveyor, so your folded documents stay organized and in proper order. The folded sheets are neatly stacked on the delivery conveyor for easy and neat removal. With a wide variety of folding patterns (including half fold, double fold, fold out, gate fold, letter fold or c-fold, and zig-zag fold), push button controls, LED indicator lamps, and simple fold plate adjustment controls, the PF-P3100 folding machine allows the operator to quickly and accurately dial in and obtain the desired fold. You can easily change the feed roller and separator pad with the tool-less removal of the buckle plate, while the fold rollers makes jam removal or cleaning a simple task. 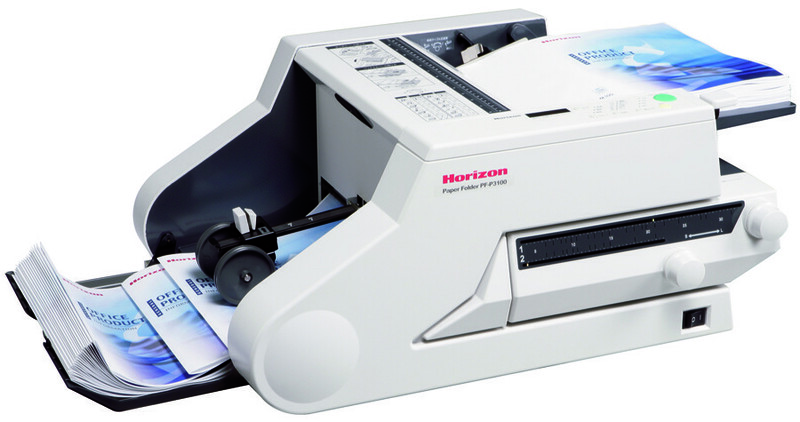 Users agree, the Standard Duplicating PF-P3100 paper folder is a step above the rest. Its ease of usability and unique operating modes make it a class of its own. The drop-in feed system uses friction to conveniently and accurately grab the individual pages into the fold plates. The push-button control --which features a sheet counter, single page test button, and three variable speeds-- makes this paper folder even better than its original model, which was limited to letter size sheets and single-speed operation.